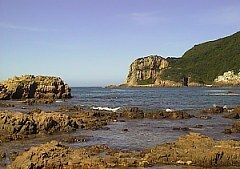 The town of Knysna has a temperate climate making it an ideal all-year holiday destination. Summer temperatures can reach highs of 38° and during the winter months (June-August) temperatures can fall to about 18º Celsius - still ideal conditions for outdoors activities! Sporadic snowfalls on the higher Outeniqua peaks during winter bring the temperature down at times. The lowest rainfall occurs during winter; the yearly average is 770 mm. The Indian Ocean at Knysna is much warmer than the sea water in Cape Town; even in winter there are many days where you can go swimming.